¡Hola! Bonjour! Hallo! Nín hǎo! Is one of your New Year’s Resolutions to learn or get better at speaking another language? We can help! The Pioneerland Library System (Winsted is a member library) offers the Powerspeak Languages program FREE to all PLS cardholders. You can learn Spanish, French, German, Mandarin, and English (ESL) at your own pace. 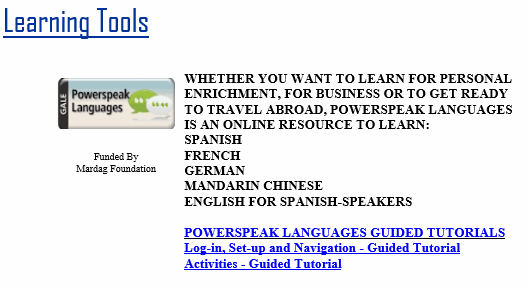 To get started, visit the PLS online catalog page at http://www.pioneerland.lib.mn.us/catalogs.htm , then scroll down until you see the Powerspeak Languages button under Learning Tools. You’ll be asked to sign in with your PLS library card number, and then you’ll be able to choose which language to learn. It’s as easy as that!